Here is a really unique control line scale model project. This one involves two separate airplanes and two separate pilots - one to fly the twin-engined C-46 Commando tow plane and the other to fly the CG-15 troop glider while it is attached via towline, and then released for landing. Doing so is no different than two aerial combat pilots chasing each other around the sky. The troop glider has its own elevator control and also uses a third line to release the tow line attached to the C-46. Anyone who has seen an R/C power plane tow an R/C glider knows that coordinating the flight paths of both aircraft can be very challenging. Most attempts to tow a free flight (uncontrollable) glider behind a power plane end up in disaster, so that is why a second pilot is needed for the troop glider. While at the 2014 airshow in Winston-Salem, NC, Melanie and I toured what was said to be by the attending aircrew that last remaining flyable C-46. If you click on the thumbnail to the left, you can see some of the photos I took of the interior. A most unusual scale CL project, the once-common Curtiss C-46 Commando twin-19-powered profile model for towing a true-scale replica of the infamous CG-15 glider. Each model is a complete control liner in itself. Glider might whip control also. Quick-fill tank useful to assure equal and complete engine runs. Top off before flight. Third-line control in glider is essential for releasing tow line. Two pilots needed. With the Commando, always start left engine first, especially if you are right-handed. Some called them "Whisper Ships" and others knew them as' "America's Answer to the Kamikaze." 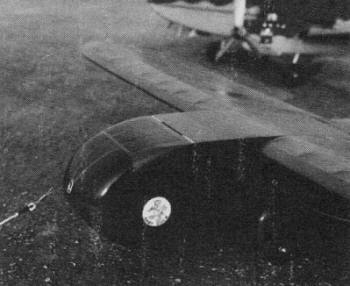 The troop-carrying glider provided a unique chapter in military aviation. Widely used by both sides in WW II, the troop glider filled a void in transport design. Through their hinged noses they could easily load large, bulky items such as jeeps and small bulldozers, which conventional cargo airplanes, regardless of size or power, simply could hot carry. The glider also could be landed in small, unprepared areas and, because of its much lower cost, could be expendable. Built by the thousands by furniture and piano factories, as well as by more traditional aircraft sources, these almost helpless craft served well throughout the war. Their exploits in Normandy and Burma are still remembered. However, the gliders now have been totally replaced by assault transports, improved parachuting techniques, and helicopters. The troop glider is gone and few will mourn its passing. To fly a replica of these gliders on control lines, no unusual skills are involved, and the price of an engine is saved. Instead of pulling a free flight glider behind a control line ship (as has been attempted before, with disastrous results), this glider is built as a normal control line model which is simply towed by another plane. This duplicates full-size practice in that each plane has its own controls and its own pilot. 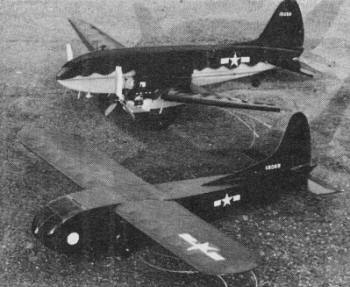 The CG-15 can be pulled by either a 35-powered, single-engined model or a lightly-loaded twin with a pair of 19's (such as the C-46 Commando, also presented here). 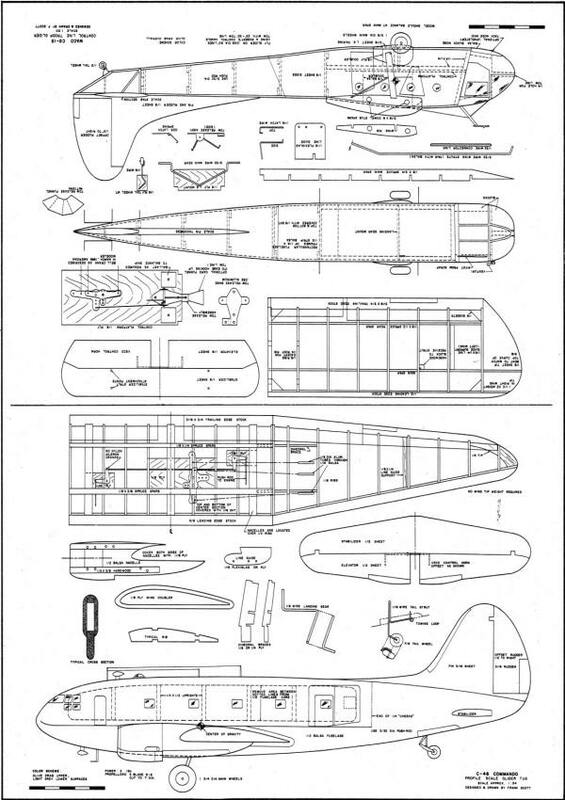 Directions for the glider construction are given first and in greater detail, since it is the more unusual of the two airplanes. The CG-15 was chosen for modeling instead of its better-known predecessor, the CG-4a, because the CG-15 with its shorter wing and less complicated landing gear seems more suited for control line flying. Since I have a large factory drawing of this machine, scale fans may be interested to know that this model is essentially scale, even to the point of using a scale airfoil section. Construction is not at all complicated. Although the model has no pounding engine trying to shake it apart, use as much care in its building as if it did, for it weighs as much and has much the same flight loads as the airplane pulling it. Begin by gluing the doublers and uprights to the fuselage sides. While they dry, bend the landing gear and attach it to the landing gear mount. 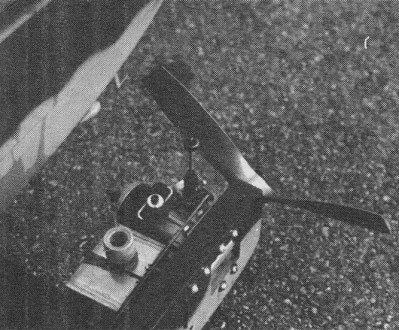 The tow release is a simple third-line-operated device consisting of a base and latch, spring-loaded in the closed position, and actuated by the third line on a compound bellcrank as described in the March 1969 AAM. This assembly is easily made but it must work smoothly to assure consistent operation. Begin by making the base of 1/32" aluminum, as shown. As an alternative, 1/8" plywood may be used. When the tow-release base has been made and bolted with 4-40 screws to the control platform, solder the 1/16" dia. wire latch to the 3/32" dia. brass tube pivot. Then, after putting the .025 torsion spring into position, mount the latch assembly to the base with a 1/16" wire pin. The upper end of the latch is secured by a length of lead out cable to the third line bellcrank. Assemble the landing gear mount to the control platform. Next, add the tow release and compound bellcrank to the control platform and hook up the controls. Assemble the sides to the platform and add the cross braces to give the fuselage its boxy shape. Finish roughing out the fuselage by covering the bottom, placing wing strut wire, and adding the tail wheel. If a two-piece strut, spliced in the center with brass tubing, is used, the struts may be left off until later. The pushrod, elevator and stabilizer are assembled before the top of the fuselage is covered with 1/8" sheet balsa. The nose is carved from blocks for needed weight, although a nice touch would be to stretch-form the nose from clear plastic. This nose can be hinged, as the real ship's was, or detachable with dowel pegs and rubber bands to permit access to the tow hook and control system. For all tail surfaces, use 1/8" hard sheet to save weight in the tail, even though the plan shows the thicker section of the real airplane. The straight wing is built with a full-depth notched spruce spar and notched leading and trailing edges. Provide holes in the root and adjacent ribs to accept the dowels from the fuselage. The scale fan may wish to cover the entire wing with sheet balsa, since the real ship used wood-covered wings. The wing is covered and assembled to the fuselage by sliding the two wing panels over the stubs from the fuselage and epoxying the wing struts in place in the drilled blocks provided. Balsa fairings then may be fitted to these struts. The fin and rudder construction completes the ship, and such details as landing gear fairings, pitot mast and line guide may be added. Finish techniques may vary. I gave the model two coats of clear, then covered it overall with lightweight Silkspan. After another two coats of clear, it was nicely prepared for a final two coats of olive drab. Use fuel-proof finish products because this model will be around glow-engined planes, fuel, and greasy modelers. The CG-15 requires much ballast secured to the front of the bellcrank mount. Proper glider balance is most important, and controls and tow release must function smoothly. To provide thrust, begin by making up a 25- or 30-ft. tow line of strong, approximately 1/16" dia. nylon cord. Use grommets in the loops to minimize wear. To prevent loosening, bind the ends, which have been coated with PlioBond cement, with thread. Regular line connectors go into the grommets at each end. A connecting link is bent from 1/32" wire and passes through the eyelet in the glider's nose to secure this tow line (via line connector) to the tow release within. A pull on the third line raises the tow latch, which releases the connector link, which then slips out of the nose. At this point, the glider is on its own. If the CG-15 has been built to scale and properly balanced for flight, the glider will tend to slide on its upholstery tack nose skids during takeoff and landing rollouts. This should cause no difficulty. Many real gliders did slide for some distance on their noses. The main wheels can be moved about an inch forward and eliminate the slide, if desired. The Curtiss C-46 Commando is scale in outline, but a profile in fuselage. Begin by assembling the control system (compound bellcrank, throttle cranks, etc.) to the bell crank mount which is then placed on the lower wing skin of the center section. The leading and trailing edges are then attached, as are the lower spars, then ribs and upper spars. The center section is finished with the upper skin and nylon covering. This seemingly backward assembly procedure allows for much easier assembly of the controls. The outer panels are conventional and must be attached with great care to the center section dihedral braces. They are covered with Silkspan, using plenty of glue and gussets at the dihedral breaks. The fuselage starts out as a 1/2" thick profile fitted with 1/4" thick "cheeks" to round it out somewhat in the manner of the double bubble section of the real machine. The area of 1/2" wood between the cheeks is removed to provide material for the profile engine nacelles and to reduce weight. With the fuselage carved and sanded, the 1/8" plywood wing doublers are epoxied around the wing opening and the wing slid through and epoxied into position. Lengths of 1/4" dowel are used to peg the wing into place by drilling through the bottom of the fuselage, through the center rib, and on upward 1/2" into the fuselage. The nacelles are attached in a similar manner, since it is important to minimize vibration in a twin. When the wing and fuselage assembly is complete, the tail surfaces and tail wheel are added, On my model, the tail wheel wire and tow hook are one piece. The Commando is colored olive drab on top and gray underneath. With decals and markings in place, the model is ready for mounting engines, landing gear, etc. The use of 1 1/2-oz. control line Goodyear fuel tanks is recommended, because the quick-fill attachment permits easy topping off of fuel tanks with the engines running. Tanks must be mounted so that the fuel pickups of both tanks are to the outside of the flying circle. The landing gear shown is scale length, but the three-blade 9-6 nylon props are cut down to 7" dia. to provide ground clearance and sufficient thrust. The landing gear can be lengthened if desired. 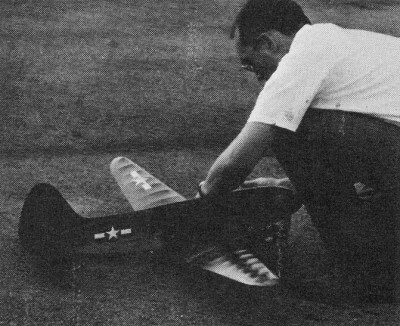 Most control line models can be flown as gliders, and most can tow too. There is nothing mysterious about this operation, but both planes must be stable, and the glider must have a suitable means for cutting loose from the tow. 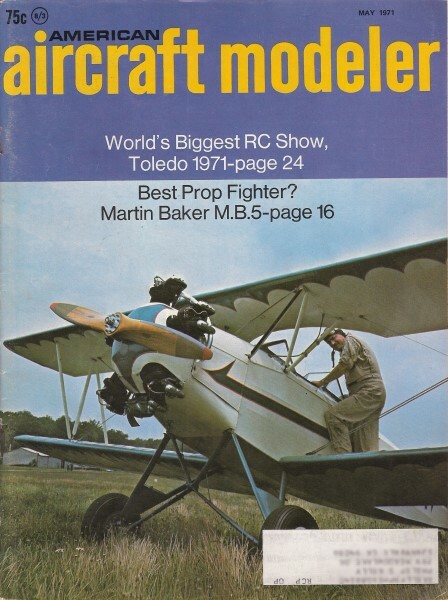 Throttle control on the tow plane is desirable, but not essential. The pilots must cooperate closely and both must realize that if the glider is permitted to fly higher than the tow ship, the tail of the tow plane will be drawn up and it may dive. Conversely, if the glider is low, the tow plane will nose up. Thus, the glider must be flown at the same altitude as the tug. At all times, the tug must be flown fast enough to provide adequate control for both planes. The glider pilot must be alert for difficulties with either airplane so that he can cut loose and thereby avoid a double crash. Each airplane exercises a great influence on the flight of the other. To fly, the control lines are hooked up and the glider stationed on the runway at the end of the tow line. The tow plane's engine(s) must be thoroughly warmed up. When the engines are running and ready for flight, the glider is rolled back to draw the tow line tight. The Commando is flown on .015" x 60' lines, the CG-15 on .008" x 60'. When both pilots agree they are ready, the helper releases the tow plane, remembering to step quickly out of the way of the glider which will be coming by shortly. (Don't leave batteries behind the tug!) The tow plane is flown off in the usual manner, with the glider, which may tend to take off sooner, flying smoothly behind. To prevent control difficulties with either model, the pilots must discuss climbing and diving before performing them. The glider is landed by pulling the third line, thus releasing the tow line, and is handled like any dead-stick control line ship. Once the glider is gone, the tow plane will behave like an ordinary model. Just don't land it on the glider.